In a file photo from Sept. 2, 2016, a woman walks by an advertisement of Samsung Electronics Galaxy Note 7 smartphone at the company's showroom in Seoul, South Korea. 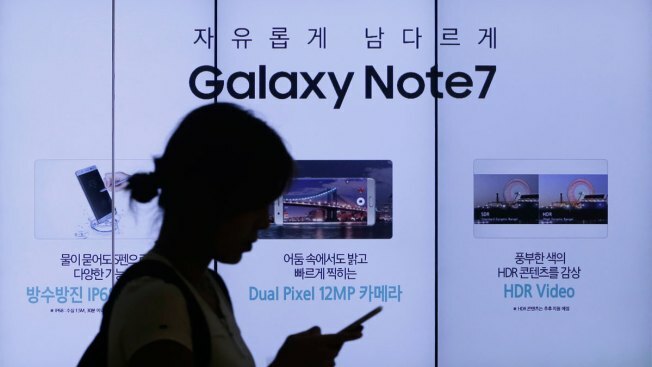 The Federal Aviation Administration on Thursday strongly urged travelers not to turn on or charge Samsung Galaxy Note 7 cell phones while on planes, after a series of incidents involving exploding batteries. In a statement, the FAA also advised travelers not to stow the devices in any checked baggage. Samsung Electronics issued a recall on Sept. 2 for the roughly 2.5 million devices after reports that batteries exploded during charging. Three Australian airlines have already barred passengers from using or charging the smartphones during flights. The recall resulted in a nearly $7 billion loss for Samsung's share value this week.